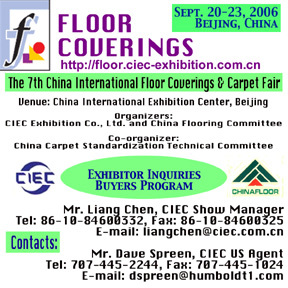 May 1, 2006 (Beijing) - The Chinese International (CIEC) Exhibition Company has announced an Industry Delegation Program will be offered for the 7th China International Floor Coverings and Carpet Fair to be held September 20 - 23, 2006 at the China International Exhibition Center in Beijing. For more information on the 7th China International Floor Coverings and Carpet Fair (Floor Coverings 2006) contact CIEC's US agent Dave Spreen by phone 707-445-2244, fax 707-445-1024, or email mail@davespreen.com. Exhibition websites can be found at http://floor.ciec-exhibition.com.cn (Chinese) , http://www.covering-floor.com (English) and http://www.davespreen.com/china/fc2002 (summary). Also see the pictorial from the 6th China International Floor Coverings and Carpet Fair. Oct. 4, 2006 (Kneeland, CA) - A Flooring Industry Delegation representing firms in the US, Canada, Japan, and the UK recently returned from the 7th China International Floor Coverings & Carpet Fair held at the Chinese International Exhibition Center in Beijing September 20-23. The group was sponsored by the Chinese International Exhibition Corporation (CIEC) and organized by Dave Spreen, President of Dave Spreen Enterprises, Inc.
Companies represented by members of the delegation included: Arimar International Corp., Asia Factory Direct, Eastern Flooring, Inc., E C Barton & Company, ETM Distribution Inc., Golden Trim Enterprises Inc., Maruhon International, US-China Associates, Wooden Floor Company, and Satin Finish Hardwood Flooring. Organized by the Chinese Flooring Committee and CIEC, the 7th China International Floor Coverings & Carpet Fair (Floor Coverings 2006) drew over 130 exhibitors. The 4-day event attracted 12,000 domestic and overseas trade visitors to see a wide range of flooring products displayed in the 100,000 sq. ft. exhibition hall. Optional factory tours were added to the Delegation program for 2006. Participants were invited to visit the Beijing Kronosenhua Flooring Company, Beijing Wellux Global Wood Product Company, Jilin Forest Industry Group (Beijing), Beijing Kangwen Wood Company, Beijing Healthy Warm Technology Company, and the Sunshine Wood Industry Company (Tianjin). Members of the delegation were also invited to attend the 11th anniversary celebration of the China National Forest Products Industry Association held in the famous Yihe Restaurant near the exhibition grounds. Spreen also organized Flooring Industry Delegations attending the 2004, and 2005 exhibitions in Beijing. He has given presentations about doing business in China to the China National Forest Products Industry Association in Beijing in September 2005, at the FloorDiscovering seminar at the DomotexAsia Chinafloor Exhibition in March 2006, and at the National Hardwood Flooring Association Convention in April 2006. For more information on this or upcoming exhibitions in China, contact Dave Spreen by phone 707-445-2244 or email dspreen@davespreen.com.